treat yourself or your family to a fun Maine adventure that’s not far from home, or maybe you want to entice out-of-town friends and family members to come for a visit? Either way, Carousel Horse Farm in Casco has the answer! Offering a wide range of rides, Carousel Horse Farm has something to tempt horse lovers of all ages and abilities. 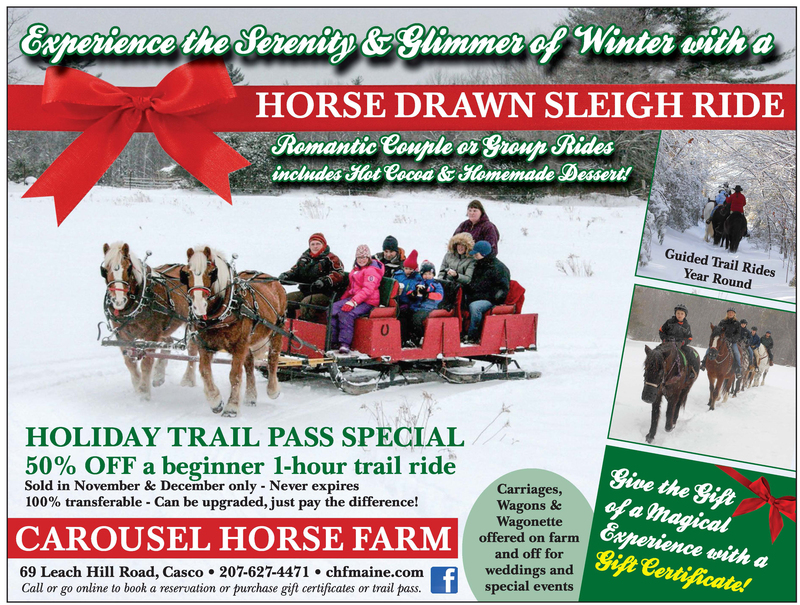 Many of the trail rides and sleigh rides depart from Carousel Horse Farm’s stables at 69 Leach Hill Road in Casco, which backs the 5,000-acre Jugtown Forest. “Access to Jugtown trails really makes us unique,” explains Tiffany Payton, who has a Bachelor’s degree in Equine Business Administration and has been in business for over twenty five years. Payton traveled all over the country and the world driving horses, and now she uses her experience to offer wagon, carriage, and sleigh rides in addition to horseback trail rides. Unlike many other riding stables, most of the horses at Carousel have lived on Payton’s Casco farm for their entire lives. 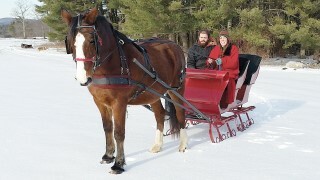 Each horse’s story is featured on Carousel’s website, www.chfmaine.com, giving riders the chance to get to know the horses before booking their rides. However, Payton adds, the choice of which horse to ride is ultimately up to her guides and will depend on several factors, including properly fitting equipment. Also, the horses rotate their days off. Beginner horseback riders are always welcome at Carousel Horse Farm. “We have a first-time rider almost every time we go out,” Payton explained. Children must be at least six years old for a horseback trail ride, and all potential riders must be able to use a two-step mounting block unassisted. If you’d like to enjoy the woods this winter with younger children, Carousel also offers a horse-drawn sleigh ride with hot cocoa and a homemade dessert for all ages. During the warmer months, Carousel offers a wide variety of horseback trail rides, ranging from one-hour long beginner rides to a four-hour ride to the top of Quaker Ridge. One of the most popular summertime horseback rides is the Pear’s Ice Cream Run, which takes riders on a 1.5-hour ride to Pear’s Ice Cream stand, where the horses wait at an old-fashioned hitching post while their riders enjoy a well-earned ice cream cone. All the rides at Carousel Horse Farm must be booked in advance online. For the Winter Wonderland ride, this gives Payton and her team a chance to email riders with suggestions about what to wear to stay warm in the Maine woods. The Winter Wonderland ride isn’t Carousel Horse Farm’s only special offering for the season. If you’ve ever dreamed of riding a beautiful horse past crashing waves, their Beach Ride is your chance to live your dream! Riders meet at Popham Beach for an hour-long ride on the sand. Because the beach is closed to equestrians during the summer, this ride is only offered October through March. Now is the perfect time to think about booking horseback rides, because Carousel Horse Farm only offers their Trail Pass during the months of November and December. The Trail Pass, which can be found on their website (www.chfmaine.com), offers 50% off all beginner rides and can also be applied to other rides. Because there is no limit on how many Trail Passes you can buy, and no expiration date, these make excellent gifts for everyone on your list! For more information call 207-627-4471 or find them on Facebook.